I scream, you scream, we all scream for anything with salted caramel! Few desserts are as decadent as my homemade Salted Caramel Ice Cream. 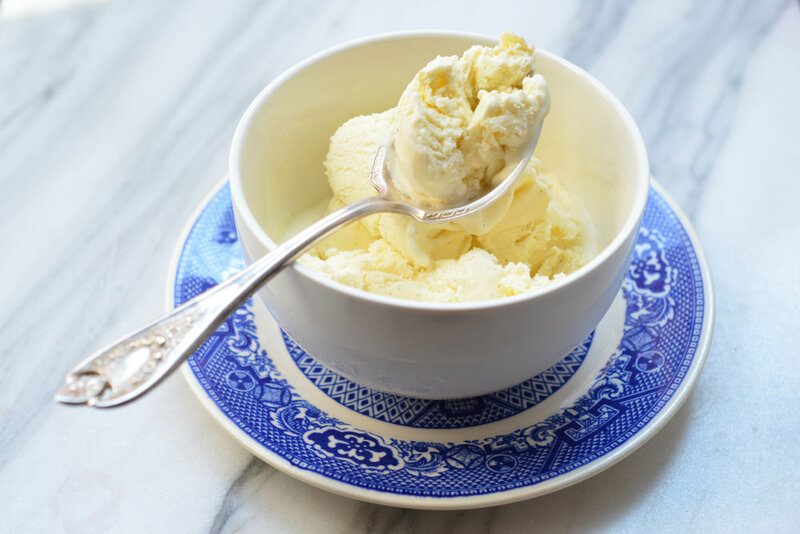 Making your own ice cream is much easier (and quicker) than you think and you don’t need to bother with trying to make the caramel from scratch, as your favorite store-bought brand of Fleur de Sel caramel sauce works perfectly! 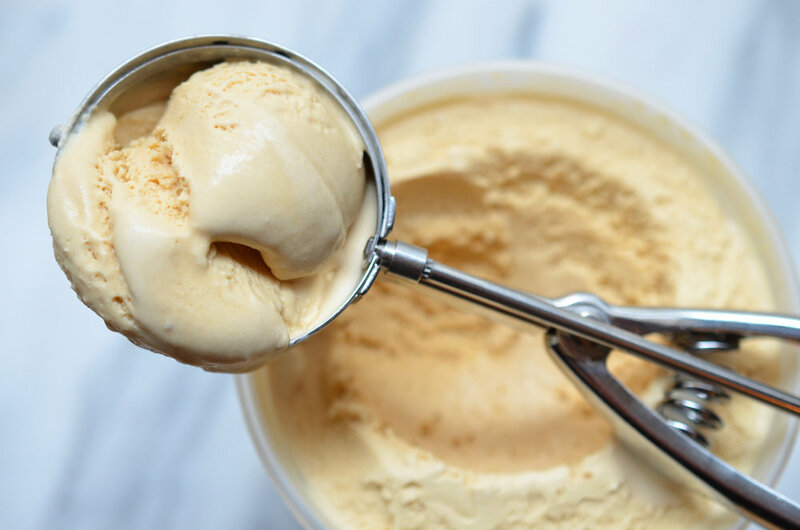 I love this straight from the ice cream maker - it has such an elegant texture but also maintains a soft, velvety consistency while in the freezer. You can serve this (with confidence!) completely solo for dessert, or it can also be paired with a fabulously rich Store-Bought Cake Made Fabulous! In a medium saucepan set over medium heat, add all of the ingredients. Stir until the sugar is dissolved. Transfer to a bowl and cover with plastic wrap, pressing it directly onto the surface of the mixture. Chill the mixture in the refrigerator for at least 2 hours, or until very cold. Once the mixture is chilled, add it to an ice cream maker and follow manufacturer’s directions. A really good chocolate ganache is a fabulous recipe to have in your arsenal of quick and easy desserts because once it is made it has so many uses. It can be used to glaze shortbread cookies, rolled into truffles, served warm over ice cream, used for chocolate covered strawberries, glazing cakes and cupcakes, or even whipped in a stand mixer until light and fluffy to use as a ganache frosting! 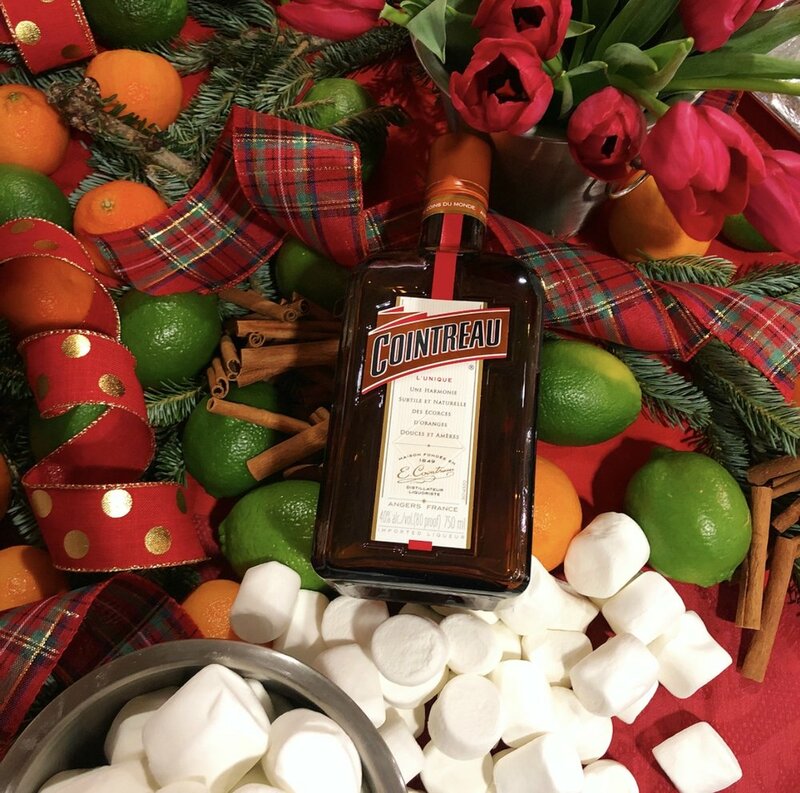 My Cointreau Chocolate Ganache is flavored with orange liqueur and Cognac, adding sophisticated (and boozy!) flavor of sharp orange and the warmth of Cognac, both of which happen to pair perfectly with dark chocolate. Best of all, it takes just a few minutes to make and instantly makes even the simplest garnishes feel special and soirée-ready! In a heat-proof bowl set over barely simmering water, heat the dark chocolate, heavy cream, honey, and salt until just melted, stirring occasionally. Remove from the heat and add the vanilla, orange zest, Cognac, and Cointreau. Stir to combine. Drizzle ½ of each shortbread cookie with just enough chocolate to coat it. Set each coated cookie onto a paper baking cup that has been flattened. Garnish with more orange zest if desired. Allow the ganache to set at room temperature for a few minutes before serving. Tip: Stirring the ganache as it cooks with help make it shiny when it is used as a glaze, making for a professional and dramatic presentation. The ganache will stay fresh in a sealed container in the refrigerator for up to one week. Idea: Once the shortbread cookies set, do not refrigerate. Store them tightly wrapped at room temperature. I think there is something so incredibly delicious about old fashioned recipes that have been re-tested with updated ingredients! Sometimes, it can be as simple as just amping up the flavor using more of the dominant ingredient in a recipe, which in this case is fresh bananas. When I was growing up, banana bread was one of the first recipes I learned to make from start to finish from my Nan. She always kept bananas in her pantry to make her grandchildren toast with butter and sliced bananas—to this day it is still my all-time favorite breakfast concoction! Inevitably, there were always overly ripe bananas in the pantry that would always magically turn into the most delicious banana bread. I even included my version of “You’ll Go Bananas Bread” in my first cookbook Entertaining with Love. For this new take on my old fashioned recipe, I really focused on making the banana the star (without any unnecessary extra ingredients or tricks), and created my Old Fashioned Banana Muffins! These little muffins give you wonderfully aromatic banana intensity and flavor, and the texture is deliciously gooey with huge pieces of whole banana. I think this may be the best banana muffin I have ever had! Don’t take my word for it, make these yourself. In fact, they are so delicious, I often give a big basket filled with them as a hostess gift for breakfast the next morning! Preheat the oven to 350 degrees. Line each well of a standard muffin pan with a paper baking cup. In the bowl of an electric mixer, fitted with a paddle attachment, add the flour, sugar, cinnamon, baking powder, baking soda, and salt. Turn the mixer to low speed and mix for 3 minutes until fully blended. Next, with the mixer still running, add the honey, vanilla, milk, eggs, cooled melted butter, and mashed banana. Mix until just combined. Using a spatula, fold in the diced bananas. Using a 2¼-inch metal scoop, scoop the batter evenly into each well. Bake for 23 to 25 minutes, or until the edges are brown and the tops are golden. Remove from the oven, place each muffin onto a cooling rack to cool. Re-line the muffin pan with another 4 paper baking liners, and follow the scooping and baking instructions above for the remaining batter. My Pumpkin Spice Trifle is one of my all-time favorite desserts to make during the holidays! Filled with the most flavorful Spiced Pound Cake and luxurious Pumpkin Orange Pastry Cream, this trifle will be a fabulous addition to your holiday soirée. While there a few steps for each component, a majority of them like the pound cake and pastry cream can be made up to three days in advance and stored in the refrigerator. Then, all you need to do is make some Vanilla Whipped Cream, and then assemble the trifle! You can also assemble this dessert in individual glass bowls or parfait glasses. Simply follow the same assembly instructions but for each individual dish. The dessert can sit out for a couple of hours, making it a perfect seasonal dessert for entertaining. This is one of those desserts that you and your guests will always remember – and ask for year after year! In a medium heat-proof bowl, whisk together the egg yolks, both sugars, pumpkin purée, cinnamon, orange zest, salt, and cornstarch until smooth. Set aside. Next, in a medium-sized sauce pan set over medium heat add the milk and heat until just under the simmering point. Remove from the heat and, very slowly, add the hot milk to the pumpkin mixture in small amounts while whisking constantly. Return the mixture back to the sauce pan and cook over medium heat, whisking constantly for 7 to 9 minutes, until very thick. Do not be alarmed when the mixture turns lumpy. Remove from the heat and add the butter and vanilla. Whisk vigorously until smooth, about 2 minutes. Place a piece of plastic wrap directly on the custard. Refrigerate until completely cool, or until ready to use - up to 3 days. Preheat oven to 350 degrees F. Lightly butter and flour (2) 9x5-inch loaf pans and set aside. Toss the raisins with 2 tablespoons of flour and set aside. With the mixer turned to low speed, add the vanilla, honey, and eggs one at a time, allowing each to fully incorporate. Turn the mixer off. Next, in a large bowl sift together the remaining flour, salt, baking powder, baking soda, cinnamon, allspice, nutmeg, cloves, and ginger. With the mixer running on low speed, add the flour and buttermilk alternately, beginning and ending with the flour. Then, scrape down the sides and bottom of the mixing bowl and fold in the raisins. Transfer the batter evenly between the prepared pans. Tap the pans on a flat surface to release as many air bubbles as possible. Bake for 45 to 60 minutes, or until a toothpick inserted in the middle of the loaf comes out clean. Once you have removed the loaves from the oven, allow them to cool in the pans for 10 minutes. Then, turn them out onto a wire rack to cool completely. In the bowl of an electric mixer fitted with a whisk attachment, add the cold cream and whisk on low. Gradually raise the speed of the mixer from low to high, making sure the cream does not splatter out of the bowl. Once the cream begins to thicken, add the sugar and vanilla. Whisk until it forms stiff peaks, or about 1 to 2 minutes. Cut the pound cake into ½-inch thick slices. Place a layer of cake in the bottom of a 2½ to 3-quart glass serving bowl, cutting the pieces to fit as necessary. Drizzle with 1 tablespoon of caramel. Top with a layer of the pastry cream, then a layer of whipped cream, then sprinkle with crushed gingersnap cookies. Repeat the same process 3 more times. The completed trifle will have 4 glorious layers. First, bake the Spiced Pound Cake - up to 3 days in advance. Then make the Pumpkin Orange Pastry Cream - up to 3 days in advance. When you are ready to assemble, find your favorite trifle dish, have your store-bought components ready, and then make the Vanilla Whipped Cream. Assemble the Pumpkin Spiced Trifle and serve!